Many older homes were not provided with an electrical receptacle on the outside of the home. In other cases the receptacle is not in a location which is convenient for the homeowner. Adding an outdoor receptacle can take a little ingenuity, but if you survey the situation, with a little planning it is not an onerous project. It is important that the outdoor electrical outlet that you install, is installed properly with the proper housings to protect it against the elements, see Figure 2. As most outdoor electrical receptacles are used, at times, to power heavy amperage devices the best method of adding an outdoor receptacle to your home is with a direct connection to a new breaker in your electrical load center (distribution panel). By connecting directly to your electrical load center (distribution panel) you can conveniently make the receptacle an exclusive 20 amp circuit for your outdoor power needs as shown in Figure 1. 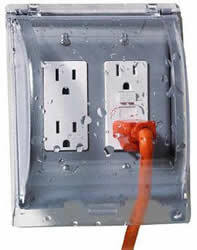 Figure 1 - Dedicated 20 Amp outdoor electrical receptacle. If running a wire directly from the electrical load center (distribution panel) presents a problem, you can pick-up power from another receptacle or possibly a light fixture or switch. If the most convenient power source appears to be a light fixture or switch you should ensure that un-switched power is always available at the device. You don't want to have to remember to turn on an indoor light switch in order to have power available at your outdoor electrical outlet. To determine if you have un-switched power at a switch box or light fixture, remove the cover plate from the switch, or the fixture from the electrical box, and see how many wires are in the electrical box (not counting the ground). If there are only 2 wires (a black and a white) in the switch box or only a black and white wire in the light fixture box, then you do not have un-switched power available. There must be a minimum of three wires in the box, plus ground wires. There is an exception to this. If you are trying to pick-up power from a 3 or 4 way switch, there will be more than 3 wires in the electrical box housing the switch and none of them may be available for un-switched power. Note: When choosing the location to tap power for your outdoor electrical receptacle, remember that you are taking power from a circuit that is already consuming power. If that circuit is almost at its capacity, adding a receptacle may cause the fuse or breaker to blow when you try and utilize the receptacle. Basements and crawl spaces are one of the most common areas to pick-up power. Do not forget the attic, as it has potential for tapping into live power. A PVC conduit can be run through the soffit and into the attic. As well, if you have siding, you may be able to hide an outdoor cable in one of the inside or outside trim pieces that runs up to the soffit and mount your new outdoor electrical receptacle next to the trim piece. While many do-it-yourself sites suggest pulling power from an receptacle on an inner wall, this can be a very difficult process created by the need to fish a wire into the electrical box without damaging the walls. It is easier to split a live wire in the basement or crawl space area. Identify a cable that has un-switched power, Figure 3.